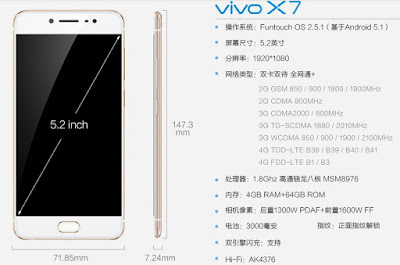 vivo has officially took the wraps off the X7 and X7 Plus smartphones. The duo share similar design and plenty of hardware, whereas the screen size differentiate them. Both devices are the successor to the last year models. Let's start with the similarities, both phones are powered by a 1.8 GHz Octa-core Snapdragon 652 processor and paired with 4 GB of RAM along with 64 GB of internal storage. The regular vivo X7 sports a 5.2-inch display, while the X7 Plus is a phablet with a larger 5.7-inch screen. 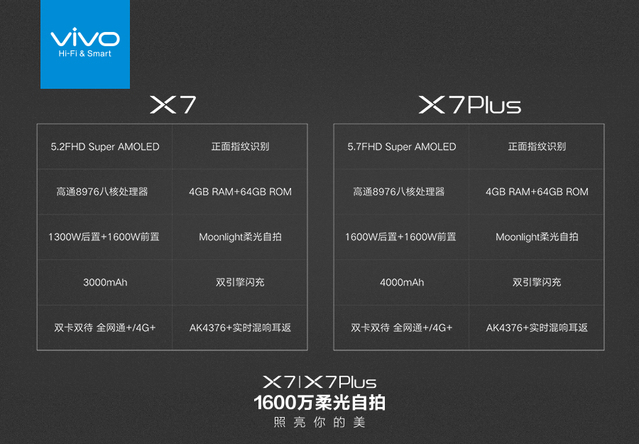 Both are Full HD 1080p Super AMOLED panels. When it comes to the camera, the X7 and X7 Plus equipped with a 16 MP f/2.0 selfie camera alongside with a 'Moonlight' soft light front-facing flash. As for the primary shooters, the X7 has a 13MP f/2.2 unit, while the X7 Plus is boosted to a 16 MP camera. Both have phase detection autofocus (PDAF) and an LED flash. 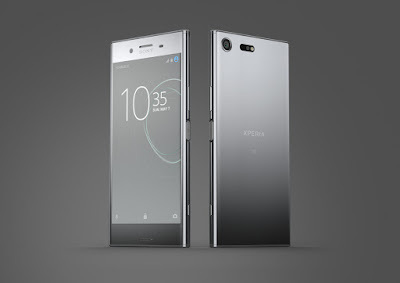 Other features included a fingerprint sensor home button, 4G LTE connectivity, dual-SIM support, Bluetooth 4.0, GPS and runs on Funtouch OS 2.5.1 based on Android 5.1 Lollipop. Last but not least, the X7 comes with a 3,000 mAh non-removable battery, while the X7 Plus packs a 4,000 mAh cell. 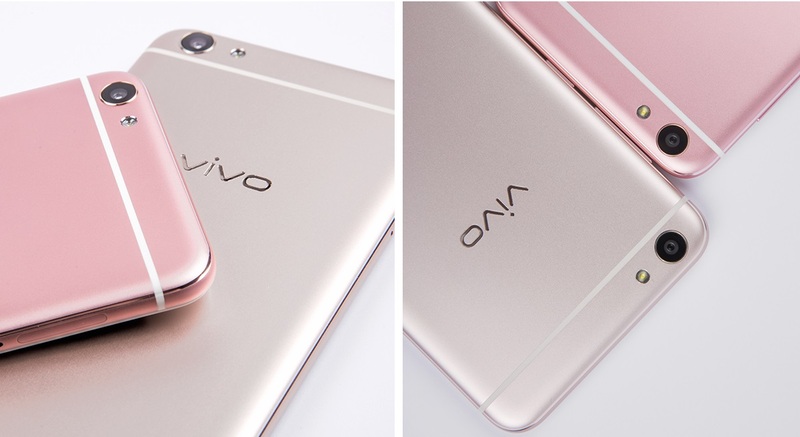 The vivo X7 measures 147.3 x 71.85 x 7.24 mm and comes in Rose Gold and Gold colour options. 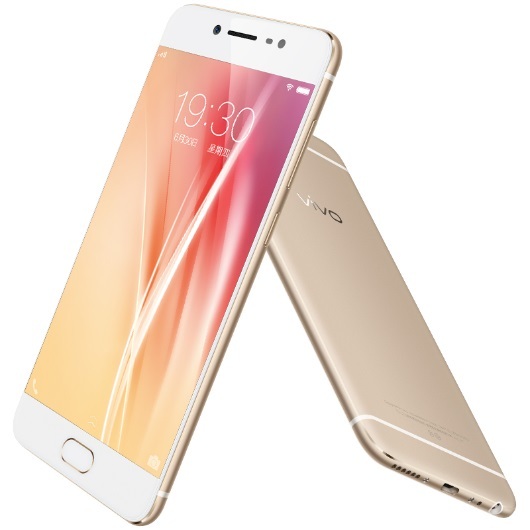 The vivo X7 will be available on July 7 and priced at CNY2,498 (about RM1,492). 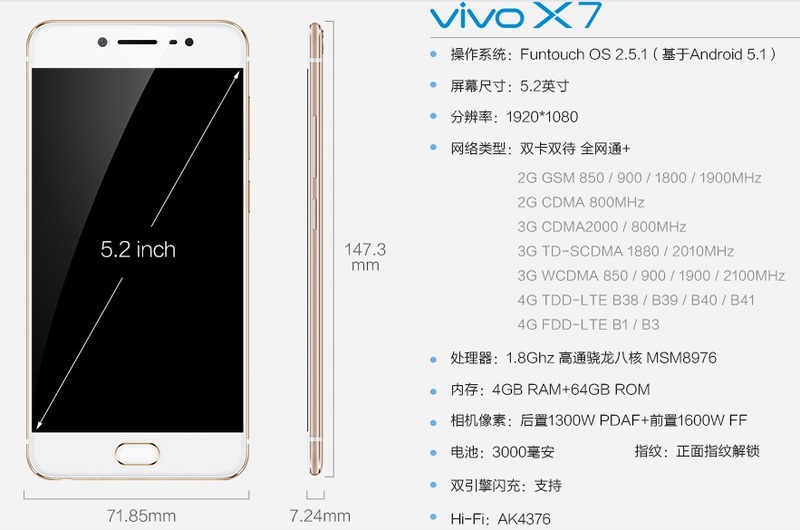 Meanwhile, no pricing details on the vivo X7 Plus have been revealed, but it'll go on sale on July 15 and that's when its price will be announced.